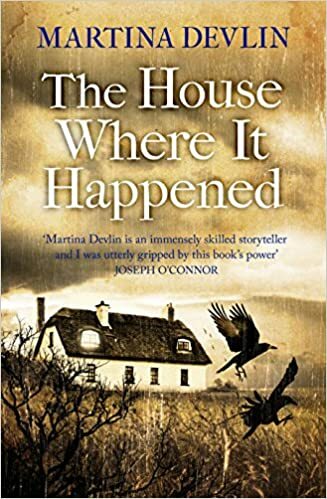 The House Where It Happened by Martina Devlin is set in 1711 and is a fictional account of Ireland's last witch trial, which took place at Carrickfergus, County Antrim. In the novel, a middle-class young woman staying with family at Knowehead, a house rumoured to be haunted, makes a series of accusations about a group of local women. Afflicted by apparent hallucinations and fits, and afflicted with strange, unexplained injuries, Mary Dunbar essentially condemns eight women to torture and imprisonment in horrific conditions. What makes The House Where It Happened stand out is the location and community in which the story is set. Knowehead is situated on the remote peninsula of Islandmagee, and the Haltridge family who now own it are Ulster Scots – Protestants whose families settled in Ireland a few generations previously, ultimately resulting in a terrible conflict with their Irish neighbours in which an entire community was slaughtered at the command of a mysterious young man called Hamilton Lock. Hamilton Lock, feared and reviled for his appallingly vicious brutality, is long dead, but tales of his almost demonic cruelty still haunt Islandmagee and rumours are rife that his ghost still walks. Much of The House Where It Happened is more or less folk horror, focusing on the witch-hunt itself. There are questions that go unanswered: while some of Mary Dunbar’s behaviour could be explained away as mental illness or even deliberate attention-seeking, some of her injuries appear not be self-inflicted, and she seems to be able to describe women from the village that she has never met. Moreover, even before Mary’s arrival, strange and unsettling things have been happening at Knowehead. Is the house literally haunted, or is it simply that the violent history of Islandmagee is hanging over the Ulster Scots community, leaving them with a sort of collective, paranoid guilt? Or could it possibly be that the very land itself is out for revenge? When Knowehead was first built, a pagan standing stone was destroyed to make way for it – and as the story unfolds, the house itself starts to seem like a sentient symbol of generations of one community being violently displaced by another and former neighbours turning against each other. The clear parallels of events in The House Where It Happened to the modern day Troubles in Northern Ireland make it an often thought-provoking read, and one which gives a fascinating and often chilling insight into the history of the area. The historical context of the novel, and the notion of not only the community but the land itself having a dark collective memory of what has happened at Islandmagee, are for me the book’s biggest strengths. The use of dialect also gives the novel's prose a distinct identity without making it a difficult read: I'm English and I didn't need to refer to the glossary provided. When it came to character I felt The House Where It Happened was a little weaker. I did enjoy the fact that Ellen Hill, who narrates the story and has her own misgivings about Knowehead from the start, is the household’s maid: it made a pleasant change for a historical novel to be narrated from a servant’s point of view, and the insights into the limitations and vulnerability of her status were interesting. However, I didn’t feel that the other characters were particularly three-dimensional, and I found it generally quite hard to engage much with anyone in the novel. It’s hard to say what I felt was missing, but even Ellen felt more to me like a symbol of something rather than someone who felt real to me. The middle section of the book, in which Mary Dunbar’s strange accusations are made an investigated, felt rather repetitive and I would have liked it to have a little more pace. Curiously, however bizarre and sinister the goings-on at Knowehead became, I felt this part of the story sometimes lacked tension and atmosphere – although I admit it’s hard to explain why. Fortunately, this picked up towards the end, with the last few chapters being perhaps the strongest and most powerful in the novel.